St. Genevieve was born around 419 in Nanterre, near Paris. She moved to Paris after meeting Germanus of Auxerre and Lupus of Troyes and dedicated herself to a Christian life. In 451 she led a “prayer marathon” that was said to have saved Paris by diverting Attila’s Huns away from the city. When Childeric I, besieged the city in 464 and conquered it, acting as an intermediary between the city and its conqueror. She convinced Childeric to release his prisoners. Genevieve was described as a peasant girl born to a Frankish father and a Gallo-Roman mother. Germanus of Auxerre encouraged her, and she only wanted to live for God. She became a Nun at the age of fifteen. As a young woman, she was admired for her piety and devotion to works of charity, which included corporal austerities, and a vegetarian diet. These mortifications were continued for over thirty years, until her superiors thought it was their duty to make her diminish her austerities. St. Genevieve had frequent visions of heavenly saints and angels. She reported her visions and prophesies, until her enemies conspired to drown her in a lake of fire. Through the intervention of St. Germain, their animosity was finally overcome. The Bishop appointed her to look after the welfare of the Nuns dedicated to God. By her instruction and example she led them to a high degree of sanctity. In 451, just before the attack of the Huns under Attila, Genevieve, with the help of Germanus’ Archdeacon, persuaded the panic-stricken people of Paris not to leave their homes and to pray. The intercession of St. Genevieve’s prayers caused Attila’s army to go to Orleans instead. During Childeric’s siege and blockade of Paris in 464, she passed through the siege lines in a boat to Troyes, bringing grain to the city. She also pleaded to Childeric for the welfare of his prisoners of war, and received a favorable response. Later, Clovis I, liberated captives and showed greater lenience after Genevieve urged him to do so. He founded an abbey where Genevieve would minister, and where she herself was later buried. Under the care of the Benedictines, a monastery was established there. The Church witnessed numerous miracles at her tomb. St. Genevieve was canonized and the Church was rededicated in her name. 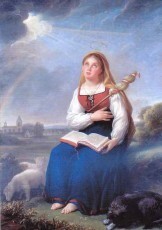 St. Genevieve was a spiritual young girl, and became a Nun at that age of fifteen. She led a “prayer marathon” that was said to have saved Paris by diverting Attila’s Huns away from the city. St. Genevieve had frequent visions of heavenly saints and angels. She spent her time totally devoted to God, and bringing others to come to know Him. She was canonized and the Church celebrates her Feast Day on January 3rd.